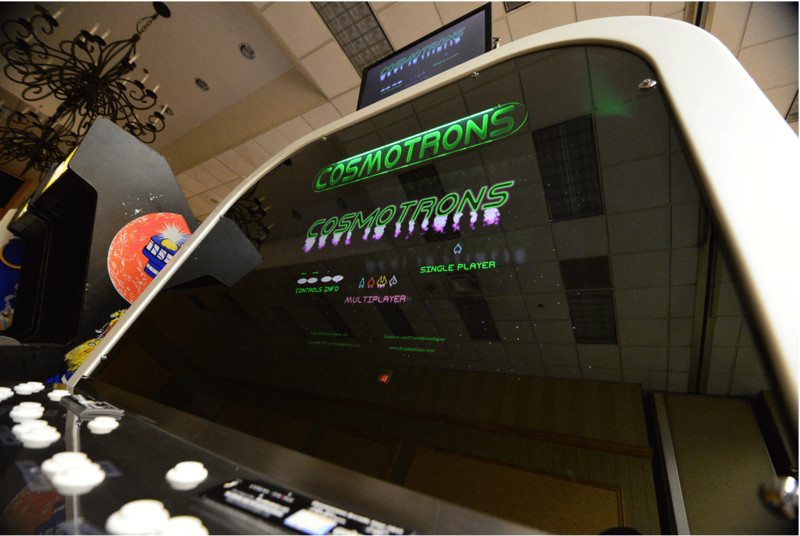 A little while ago, we covered a new indie game that was being designed for home consoles but just so happened to make a public appearance as an arcade machine – Cosmotrons. The game formula is based on Atari’s classic but infrequently seen Gravitar, a game that was notorious for being difficult at a time where gamers craved such challenges. I’ll get into where it departs from Gravitar in a little bit. 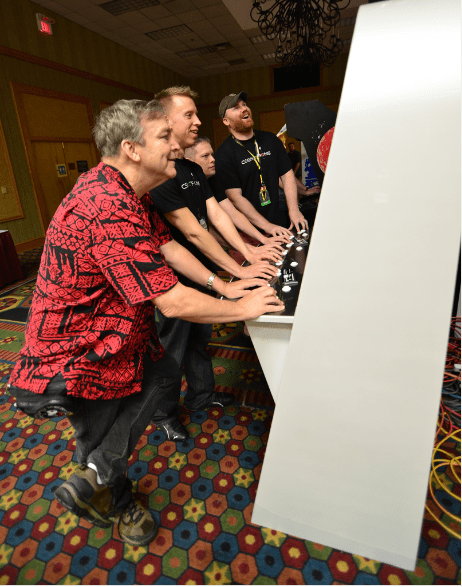 After the team known as Arcadeaholics LLC had some public appearances at events like Midwest Gaming Classic (where it won two awards for Best Multiplayer Game), they have encountered demand for the game to be produced in the arcade format. That demand was such that they are now exclusively focusing on the arcade version of the game, to get that to a satisfactory point to release the game to arcades later this year. As a note to interested operators, this game will have some arcade exclusive content on it so the console version will differ slightly although the exact differences at the moment are TBA. As a part of their marketing and awareness efforts, the indie development team has launched an effort to bring the game closer to you with a cross-country tour. That tour hopes to visit around 20 arcades on the trip as they take the game on a 6000 mile journey from Wisconsin to California and back again. This will also help them in the development of the arcade version, getting to see locations in person and talking with both operators and players along the way. The tour anticipates taking place from July 13th to August 12th. As a disclaimer to the reader, I am personally looking into having my arcade in Utah join the tour, a final decision will be tomorrow. But I am not getting paid for that – I’m wanting to help them out on their journey as it isn’t cheap to haul a game that distance along with food & lodging. If you have your own arcade in the US that would be interested in hosting the game for a couple of days or you just want to give these guys your support then you can also join in the campaign via their Gofundme page. As of this writing, they are just $20 shy of $2000; the end goal is $6000. So far, there are some other arcades that have committed to the tour but the major sponsor would be the California Extreme expo. 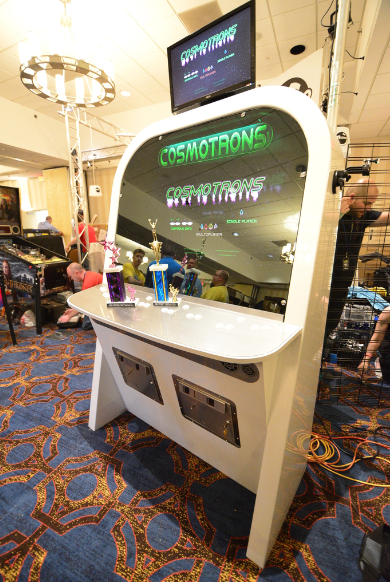 We mentioned CAX every year and with them having an eye for classic games and that style of gaming, Cosmotrons certainly fits the bill. Naturally, that means that Cosmotrons will be at CAX 2017 which is being held on July 29-30th in Santa Clara, CA. I’m sure you are curious to know more about this game, especially if you are wanting to consider donating to the cause. As mentioned, the game pulls heavy inspiration from the Atari sleeper hit Gravitar, a game that was sort of like Asteroids and Lunar Lander blended together. Such a game style is highly unusual in today’s arcade market, even with some classics getting remade or revamped with a twist. With Cosmotrons, it maintains that “vector” graphics style look, eschewing fancy 3D graphics for very old school colored dots and lines. A big thing that it adds is multiplayer, up to four players. There are currently seven ships to choose from (Noob for beginners; Recruit for speed; Squid for rear fire; etc. ), with the craft and the levels being balanced to appeal to arcade situations. This makes the game more of a space arena battle game than Gravitar was. It also has different modes to choose from including: Single Player (timed speed runs, collect beacons); Four Player VS (free-for-all); 2v2 Battle (which includes team objectives; Invader mode (1 player vs. 3 with that one player as a powerful ship called the Juggernaut) and bonus rounds (race to the end). The game also has around 20 maps with more content that is going to be made available via free online connectivity. The team is looking into offering two different cabinet designs as well as a kit option but it will likely be after the tour that such things will be nailed down with certainty. You can stay up-to-date on Cosmotrons by following their Facebook page and once again, don’t forget the Gofundme! Thanks to Shane Gutbrod for the info! Thanks so much for the very nicely written piece on Cosmotrons! We really to appreciate the support everyone. We hope to be a small part in helping generate more interest and growth in the arcade scene. We are so excited for this tour and are looking forward to new Cosmotron pilots getting to determine: Which ship are YOU?